Sydney, the emerald city towards which all politicians, businessmen and other spivs naturally gravitate is little more than a fringe of high rises and multi million dollar mansions with Harbour or Ocean views. The rest, from inner suburban Glebe to the Blue Mountains, 4 million plus of Sydney’s official 5 million population, is the West, its heart Parramatta, these days a CBD in its own right, 20 km up river (map). And it is the West which is David Ireland’s home. Reportedly born on a table in Lakemba (south-west Sydney) in 1927, Ireland grew up around Parramatta and was employed for a number of years at the Siverwater oil refinery, on the river downstream of Parramatta, and the setting for his most famous novel, The Unknown Industrial Prisoner. In another novel, The Glass Canoe, the protagonist discusses being good at school work but chucking it in to be with his mates. Interestingly, although it occupied most of his teen years, he does not seem to write about the War (WWII). Over the last couple of years looking at early Australian women writers we have been building up an idea of the characteristics of each “generation” (see Gen 1, Gen 2). We’ll see later in the year that my Gen 3, which encompasses the 1920s through 1950s, is marked both by social realism and the last decades of white monoculturalism, although plenty of guys in particular stuck with the tropes of Gen 2 – nationalism, the Bush, mateship (and that is still true today), extending them into writing about the two World Wars. It is often said that ‘the sixties’ didn’t arrive in Australia until the 1970s, but realistically they arrived and Gen 4 dates from, around 1966 or 67, with anti-Vietnam War protests, second wave feminism and the advent of multiculturalism following post war migration from southern Europe, dates in fact from the late teenage years of us Baby Boomers. Over the course of 2019 I hope to write and/or collect reviews (from you!) for all Ireland’s novels, and of course to set up a page so that they are all accessible. Ireland is undoubtedly an important Australian writer and The Unknown Industrial Prisoner especially is one of our great books. For various reasons Ireland has become unpopular with readers and with publishers and his reputed right-wing politics may be part of this though I could find nothing through google. His most recent work The World Repair Video Game was eventually serialized and then published in hardback by Tasmania’s Island literary mag (who may still have copies on hand). Ireland will be 92 this year. Is he still writing? You’d think not. But I suspect that 18 year gap after The Chosen contains more than one unpublished novel. Burn I found intolerably racist and could not finish. Ken Gelder, Atomic Fiction: The Novels of David Ireland UQP, 1993. Do you remember this sentence from Seasons Greetings 2018 – “I’ve pulled my last trailer for Sam and Dragan.” Not! This other sentence – “I’ve already handed the truck over to a mechanic who has promised to set it up for the next million kilometres of its working life” is the clue. As is the way with engine rebuilds, one thing led to another, the price went up and up, and trailer buying has been pushed back a month or two. Once the mechanic was finished I took the truck around the corner to a signwriter (a decal maker these days) with the results you see. Years ago, when paint jobs were free with new trucks Milly and I spent ages coming up with fancy colour schemes for the new Scania I never bought. These days, particularly in the West, most trucks are white, but one of the joys of ownership is being able to personalize your ride. Anyway, I sat down last weekend with Sam and Dragan and we decided it made sense to go on a bit longer as we were, build up a bit of a backstop before I splashed all my cash on trailers. (I looked at finance, but the idea of releasing all that info into the wild filled me with horror). So here I am heading off to … Melbourne as it happened and now I’m on the way home. The other thing I did over the break – apart from my quarterly and annual tax, isn’t that neverending?! – is I made myself a website, using WordPress, billhtrucking.com if you want to have a look. I used a totally new gmail account to set it up, but they still managed somehow to link back to theaustralianlegend. Don’t ask me how. I’ll use the site to issue posts, but only to advise clients, potential clients (and family) where I expect to be next; and really only as a device to maintain a list of trips done. I also had a shot at using the ‘gallery’ option for photos, but I’m not really happy with it as it adds new pics at the bottom, rather than at the top where you would see them straight away. Still, WordPress were very helpful in getting me started and another chat with their help desk would probably get that fixed too (no they didn’t). Thank you everyone for participating in AWW Gen 2 Week – readers, commenters, reviewers. Please note that Brona has done a second Ethel Turner review – The Story of a Baby – which I won’t be able to read for another day or so (sorry Brona). Interestingly during the week, we didn’t discuss Barbara Baynton, Henry Handel Richardson, nor the period’s most popular books, My Brilliant Career and Seven Little Australians. But these have all been reviewed previously and I think that with the authors we did discuss this time we have gained a good idea of how women writers responded to the dominant trends – nationalism and bush realism – of the 90s. There’s plenty more on the AWW Gen 2 page, lots of old reviews, more background posts including two on Louise Mack by Sue and Lisa, and with many of the older books out of copyright, I have put links to downloadable text whenever I come across them. Lisa (ANZLL) also did two posts on Catherine Helen Spence (here) (here) but as I already had entries for Spence on the AWW Gen 1 page, I took the easy option and linked them there. I have a first (and only, probably) edition of Miles Franklin’s Joseph Furphy, from now long-gone antiquarian book seller, Magpie’s, in Fremantle, originally belonging to a Paul Le Comte, “member W.A.H.S.” (WA Historical Society?) and including newspaper cuttings and – Emma and Lisa will like this – an information card for Furphy’s burial site in Perth’s Karrakatta Cemetery. The time is not yet ripe for a definitive biography of Joseph Furphy. The Australian attitude toward biography opens the case for Mateship versus Modernity, and so far Mateship holds the pass. No frankly searching study of the lives of our prominent personages would be tolerated … because of the still lingering conventions of modesty and reticence by which British middle-class behavior was regulated until inhibition was loosened in the preliminary war of 1914-18. Jill Roe (2008, p.388) thinks that Franklin is averting to the possibility of an affair between Furphy and Kate Baker (1861-1953), Franklin’s ‘collaborator’ in this work. The married Furphy and Baker, 18 years his junior, met in 1886 when Baker was teaching near Rushworth (in central Victoria). They became lifelong friends. Baker was important in encouraging Furphy to write, and after his death and her early retirement at 52 she did all she could to publicize and safeguard his work (ADB). By 1939, when she spent 5 months in Sydney with Franklin getting this biography underway, Baker was elderly and stone deaf and Franklin largely took over, so that the collaboration consisted of Franklin writing from the material Baker had collected over a lifetime. Franklin was herself a Furphy fan and she and Furphy had exchanged complimentary letters and subsequently met, in 1904 (see also Such is Life, Abridged!). It is sometimes stated that this biography won the 1944 Prior Prize, the year the book was published, but in fact Franklin won the 1939 Prior Prize for the essay Who was Joseph Furphy? which she dashed off after Baker had returned to Melbourne, though she shared the £100 with her (Franklin initially came second but the ms which beat her, MH Ellis’ biography of Governor Macquarie*, was belatedly judged to be insufficiently foot-noted). Franklin begins at interesting point. After a brief ‘Furphian’ digression – one of the features of Such is Life is its flights down side alleys – on the development or otherwise of a distinctly Australian literature, she gives us Kate Baker, newly hatched school teacher, rushing to catch the train, and subsequently a coach and then a spring cart to the home of Isaac Furphy – brother of Joseph – and his family where she is to board for a year, before moving six miles to board another year at the home of Samuel and Mrs Furphy, Joseph’s parents, constantly inundated, by Joseph’s brothers and sisters and their children, by Joseph’s wife Leonie and their children, by everyone around except Joseph whom Kate finally meets only on the day of her departure. When Joe began to talk he justified himself as the literary prodigy of the family. He was then forty-four, Kate Baker in her twenties. Joe talked till 1.00 am, and again the following night. Then it was time to leave, and she asked him to visit her and her parents some time in Melbourne. A copy of “Childe Booth’s Pilgrimage” has been preserved. It bears traces of easy acquaintance with Scott, Longfellow, Homer, Byron, Burns, Moore and others. Written when the boy was between fourteen and fifteen years of age, it shows him in embryo the Furphy who in 1897 delivered of Such is Life. Joseph was one of five brothers, and journals were kept by their mother of their writings, ballads and odes to lost loves. The Furphys had come out from Ireland in 1841, were employed and sometimes self-employed in various locations outside of Melbourne, including Kyneton where Joseph went to school. In 1868 they took up land, “Sand Hills”**, around Lake Cooper (map) in the names of Samuel (senior), Joseph and Isaac, building themselves homes which survived into the 1950s, and it is there that Kate Baker came to teach. Today it is an inspiring sight to gaze from Mount Burramboot over the glowing plains which reach away to the blue distance for leagues on every side. In the foreground Lake Cooper and its satellites glisten like sapphires in a shield. Older brother John, a blacksmith, had in the meanwhile set up the famous Furphy Foundry in Shepparton. When Joseph’s enterprise failed, due to drought and disease in the cattle, Leonie wrote home for help and a position was made for Joseph at the foundry. At last he had a settled home and could begin to write. His first piece, “The Mythical Sundowner”, appeared in the Bulletin 5 Oct 1889, signed Warrigal Jack, though he later used Tom Collins, a “synonym for idle rumour” (as ‘Furphy’ was to become during WWI). Over the next decade or so, he was engaged constantly, when he wasn’t working, in reading, writing, and researching, setting tasks for Kate Baker, and corresponding with fellow pedant and polymath William Cathels. The plan of the book is not like any other that I know of – at least, I trust not. Also you will notice that a certain by-play in plot and éclaircissment is hidden from the philosophic narrator, however apparent to the matter of fact reader. Stephens wrote at length to Furphy setting out in detail the economics of publication. First requirement was a typed copy and Furphy, fearful that a typist would bowdlerize his often profane masterpiece, purchased Shepparton’s third typewriter, taught himself to type, and knocked out a copy in … 12 months! At his point in the book Franklin reproduces a great deal of (fascinating) correspondence. I find it interesting that both Stephens and Cathels, the first people to read and admire Such is Life, saw it as an idiosyncratic but essentially true-to-life account of Bush life, whereas I see it as one of the great works of Modernism, essentially about writing and language as Picasso’s work is about painting, not funny-looking women. For three years the Bulletin prevaricated about publishing. It was a fine book, but much too long. They would bear a loss out of the goodness of their hearts. And so on. Furphy finally conceived the idea of excising two strands of the original, which would go on to be books in their own right, the novel Rigby’s Romance and the collection of stories which eventually became The Buln-Buln and the Brolga. Even so, correction, re-typing, illustration, proof reading dragged on through all of 1901 (when Miles Franklin’s own My Brilliant Career stole some of his thunder) and 1902. … the studied inconsecutiveness of the “memoirs” is made to mask coincidence and cross-purposes, sometimes too intricate. In 1905 Furphy and his wife moved to Perth WA where their children were already established. They lived between the rail line and the sea, Cottesloe or Swanbourne. Between making their homes habitable, and surf bathing, he was fully occupied and after only little more than a decade, his writing career was at an end. Rigby’s Romance was published in the Barrier Truth (Broken Hill) in 1905-6 and it was 15 years before Kate Baker could arrange to have it published as a book. Furphy died in 1912 without ever returning to see his friends in Melbourne, but maintained an active correspondence. The last quarter of the biography is an analysis of Furphy’s work, including Miles’ frustration at Furphy’s inadequate depiction of women, ending with a discussion on the relative merits, and fame, of Ulysses, Such is Life and Remembrance of Times Past. Miles Franklin, in association with Kate Barker, Joseph Furphy: The Legend of a Man and his Book, Angus & Robertson, Sydney, 1944. Such is Life is available from Text Classics in print (2013) and e-book. *M. H. Ellis, Lachlan Macquarie: His Life, Adventures and Times – “after a fortnight’s examination, Ida [Leeson, Mitchell Library] declared the work undocumented and full of inaccuracies.” Franklin’s work was “elevated from ‘highly commended’ to first place, with a rider that entry No. 62 would have won had it been fully documented and the references checked.” From the NLA database it appears that Ellis’ work was published in stages from 1942 to 1952, and has since been reprinted. **Googling ‘Sand Hills Furphy’ brings up directory entries which indicate that the family still farms there; a family reunion on May 25; and a death notice for Joseph’s mother. Sisters in law have their uses. Millie’s youngest sister on a visit from Sydney over the New Year was sorting through the bottom shelf, the junk shelf of the bookcase in Psyche’s old room and came across not just the last extant copy of my dissertation but my long missing First Edition copy of Vance Palmer’s The Legend of the Nineties (1954). … there has grown up a legend of the Australian nineties as a period of intense artistic and political activity, in which the genius of this young country had a brief and brilliant first flowering. Something new, it is claimed, emerged into the light. A scattered people, with origins in all the corners of the British Islands and in Europe, had a sudden vision of themselves as a nation, with a character of their own and a historic role to play, and this vision set fruitful creative forces in motion. If the nineties have seemed to stand out with special prominence it is partly because of the lively journalism that flourished at their beginning: weeklies like the Bulletin, the Boomerang, the Worker gave a suggestion that the national mind was in ferment as never before. This culture, this imaginative life, had so little concrete form, was so much a matter of primitive habits and observances, that it had small chance of being taken seriously by people whose minds were preoccupied with a particular kind of progress. But that is also the last he has to say (about Aborigines – our preoccupation with the “yellow hordes” remained front and centre). The Legend began in the Bush because the (white) men there were one people, unified by common experience and by the constant movement throughout the interior of livestock and workers. The cities, although more populous, were stratified by wealth and class, unionism didn’t take as well even in the manufacturing centre, Melbourne; and there was no commonality of purpose between the classes. That the great bulk of Australia’s arable land, up until the Land Acts of the 1860s, was divided into the enormous runs of the squatters meant that by necessity the bulk of the rural workforce was itinerant, their myth making oral, almost entirely through ballads and tall stories, long lost even before the turn of the century. When Banjo Paterson began collecting ballads the earliest dated back only to the 1860s and the famous bushrangers: Ben Hall, Harry Power, Ned Kelly. Compulsory schooling meant that by the 90s literacy was widespread; and newspapers and magazines circulated freely. “A great deal of the importance of myths, it must be insisted, lies in the way they reveal values actually held by their makers.” In the 1890s the myths of the Bush were circulated in written ballads, but still the old ways held. Miles Franklin recounts in the semi-autobiographical Cockatoos that young men into town for the Show would stand around a fire each waiting to recite his scrap of Paterson or Adam Lindsay Gordon. Of the weeklies mentioned above, the Boomerang and the Worker were founded by William Lane, who with 800 followers, the cream of the recently-quashed union movement according to Palmer, sailed to found the utopian New Australia in Paraguay in 1893. That left the Bulletin under JF Archibald to become the bushman’s bible. The Bulletin … stood for a republican form of government; payment of members; one person, one vote; state revenue derived directly from the land; complete secularization of education; reform of the criminal code and the prison system; a united Australia and protection against the world. It denounced religious interference with politics, foreign titles, the Chinese, and imperial federation. Archibald’s greatest gift was “discovering men of talent”. Palmer, despite being married to one of the greatest, makes no mention of women of talent. For some years Archibald’s Bulletin was to act as the chief instrument for expressing and defining the national being. In 1893 AG Stephens came to the paper, and his ‘Red Page’ became an important showcase for Australian writing. Henry Lawson and Banjo Paterson who wrote for the Bulletin from the earliest days, and later Joseph Furphy and Steele Rudd, and all the other now forgotten or anonymous contributors embodied in their ballads and stories all the important elements of the myth of the Lone Hand, the Australian bushman – strength, independence, mateship, laconic humour (and of course the complete absence of women). The final chapters discuss politics, the rise of organized labour, the even more effective rise of employer organizations (plus ça change etc. ), the land bubble, banking failures, Federation. In the interior there was little talk of federation but the essential unity of Australia as a country with common interests was taken for granted: in the capital cities, federation was discussed as an important issue, but it was regarded as an alliance between countries foreign to one another and having rival economies. A tradition of democratic writing was thus established, and it has not been lost, for it is strongly marked in the Australian novel and short story of today. Vance Palmer (1885-1959) grew up in rural Queensland and began writing at the end of the period he describes here. He became a respected though now largely neglected novelist and alongside Nettie (his wife), was at the heart of Australian writing for decades. How he then manages to completely overlook women’s writing is beyond me. Vance Palmer, The Legend of the Nineties, Curry O’Neill Ross, Melbourne, 1954. I nearly forgot to do this, but I’m home, on holidays, I can do it now. That’ll make seven pending posts, so this week will look a bit busy, as will next week as we knock over Gen 2. I’m impressed by the new releases I listed in Best Reads 2017, I’ve read nothing like that – quantity or quality – this year past. Three or four crime fiction on audiobook and that’s it. Elizabeth Tan’s Rubik was the best ‘new release’ I read but it’s actually 2017, and I squeezed in the marvellous Tracker before New Years but that’s 2017 too. The nearest I got is my current bedtime reading, AS Patrić’s The Butcherbird Stories (2018). Must do better! I’ve already read my first 2019, and written a review, which I’ll put up in a day or two (Sue/Whispering Gums lists her best of 2019 new releases here). Here are my lists for 50, 100, 150 and 200 years ago drawn from Annals of Australian Literature, with just one review. I’ve read a few of them (4 or 5), and notably Frank Dalby Davidson’s, The White Thorntree (1968) which marks an important step between the 1950s and what we baby boomers regard as modernity. 44 books published, 11 more than the previous year, though one was in French, and including two immortal books for children. Mollie Skinner, Letters of a V.A.D. Just six books! And Steele Rudd and Mary Fullerton were born. One book, which is one more than the previous six years. I know I don’t need to remind you of Australian Women Writers Gen 2 Week 13-19 Jan. 2018. In writing this post I see I have been overlooking Mollie Skinner – here with Letters of a V.A.D. (1918) – who co-wrote The Boy in the Bush with DH Lawrence. Also, seeing the Chantic Bird (1968) reminds me that Lisa (ANZLitLovers) has persuaded me to have a David Ireland ‘year’. So over the course of 2019 I hope that by my own efforts and by some judicious sharing of yours, I can put up reviews for all his novels. I’ll commence a David Ireland page with a list of his works, and what reviews I can find, once Gen 2 Week is over. Sue (Whispering Gums) asked me to remind her that AWW Gen 2 was coming up, so here you go Sue, you have one week. In one comment I think you said you had a Louise Mack to read, but I can’t find it (the comment) again. Michelle Scott Tucker has already sent me her guest post on Mary Grant Bruce’s Billabong books and I warn you all, she sets a high standard. As a sort of introduction I have a post on Vance Palmer’s The Legend of the Nineties – sort of, because he barely mentions women at all – which I will put up this Friday, then I think I will put Michelle’s up on Sunday night. After that I will put up/link to posts as they come in. I am working on Miles Franklin’s Joseph Furphy for my main post, though I might try to read/review Louise Mack’s Teens as well. Apart from these – off the top of my head – there will be posts on works by Rosa Praed, Miles Franklin, Henry Handel Richardson, Katharine Susannah Prichard, so it’s looking good! No Barbara Baynton though I’m open to being surprised, and between us we’ve done a fair bit on her in the past. I’ve changed the image at the top of the AWW Gen 2 page to the portrait (above) of Henry and Bertha Lawson’s daughter, Bertha by Florence Aline Rodway (1881–1971) after I saw her mentioned by Palmer as being ‘encouraged’ by Archibald of the Bulletin. She was a portraitist of some repute and Art Gallery NSW has quite a few of her paintings. If you know of other women painters from this period I’d be interested to hear about them. Please let me know when you have done a review, particularly if you think I might not otherwise see it, and I’ll share it or at least make sure it’s included in the end of week wrap and that it’s linked from the AWW Gen 2 page. The cover painting above is Russell Drysdale’s The Drover’s Wife (1945) from a trip he made the previous year and his drawing A Drover’s Camp near Deniliquin (1944). Deniliquin is in NSW, 80 km north of the Victorian border at Echuca. I have often been through that way, heading east to Conargo, Jerilderee, Wagga or north to Hay, Hillston, Bourke and on into outback Queensland, and drovers and their mobs of sheep are still a common sight. Twenty years ago, destitute, I seriously considered the merits of getting an old truck and a plywood caravan and travelling at walking pace as the sheep in my care grazed the back roads and byways of the Riverina. As it happens Milly saved me, for the time being anyway, and that’s a story for another day. Drysdale always claimed the naming of his painting was unconnected with the title of Australia’s most famous story, but many have sought to connect the two, not least Murray Bail, who in his own The Drover’s Wife (1975) claims that the big bodied woman is his (or more strictly, his dentist narrator’s) missing wife. In this book Frank Moorehouse brings together a whole collection of this, his own and other writers’ stories and essays – on some of which I have already written (Louisa Lawson vs Kaye Schaffer, The Drover’s De Facto) – to make a fascinating whole. Let me attempt a brief chronological overview (Moorehouse’s book is arranged thematically). The undoubted source of Henry Lawson’s The Drover’s Wife (read it here) is his mother, Louisa’s early married life in the bush near Mudgee, NSW, her husband often away droving and prospecting. Louisa chucked it in in 1886 when Henry was about 19, moved to Sydney, bought a newspaper, and became a passionate advocate for women’s rights. She was a loud forceful woman, Henry was not, and a great story teller. Moorhouse includes an essay by Louisa, The Australian Bush-Woman (1889), see above, which discusses many of the elements of hardship and isolation which Henry includes in his story. Henry’s The Drover’s Wife first appeared in the Bulletin in 1892. Two years later Louisa used her presses to publish “a poorly printed collection” of Henry’s stories entitled Short Stories in Prose and Verse. Then in 1896 Angus & Robertson brought out a more comprehensive collection, While the Billy Boils. Academic Ryan O’Neill demonstrates how the Bulletin‘s house style moulded Lawson into one of world’s great short story writers. He argues that the influence of the Bulletin‘s and Lawson’s “Bush Realism” was to be hugely influential in Australian short fiction into the 1960s. Moorhouse looks at iterations in the text to interrogate Lawson’s attitude to race. So, the B in Blacks is capitalised for the first time in the version the Lawson’s printed, but is subsequently discarded, while the comic King Billy intercedes between the drover’s wife and the Black midwife, Mary only in later versions and, according to Moorhouse, only after Lawson got feedback from his cronies down the pub. In a separate essay Matthews argues that Lawson was gay. Lawson’s genius was to both write within the Bulletin format and to rise above it, subtly – and not so subtly in The Drover’s Wife – spreading his mother’s first wave feminism, while all the time being upheld by men as the messiah of mateship. Men sought to emulate his laconic style, from Vance Palmer to Roger McDonald, but he was also influential with women, not least Miles Franklin and Eve Langley. In lieu of interrogating this influence Moorhouse has included ten or so short stories which reference Lawson’s story. I have already reviewed The Drover’s De Facto; others include The Drover’s Wife’s Dog by SF writer Damien Broderick; a long story of a young woman’s coming of age, Afraid of Waking It by Madeleine Watts, good but barely relevant; Murray Bail’s story about the woman in the painting; and Moorhouse’s own mock account of an Italian student’s misreading of the Lawson and Bail stories and Drysdale’s painting, which allocates to Australians the extreme affection for sheep usually ascribed to Kiwis. 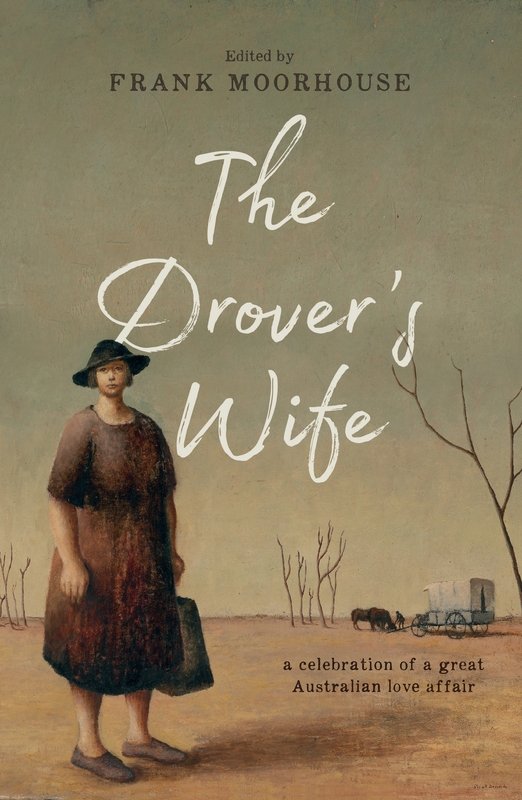 There are some excellent photos of Drover’s Wifes paintings, images from stage works, notably Leah Purcell’s play (and also stage notes), and a wonderful pair of images titled the Drover’s Wife, Urisino Bore (1958) of drover Ronald Kerr and his sixteen year old wife Mavis, married 39 weeks pregnant (by Jeff Carter (1928-2010)), and again in 2011 after more than 50 years together (and quite often apart, as is the case for all drovers’ wives). Sue/Whispering Gums has recently re-brought Barabara Jefferis (1917-2004) to our attention and her The Drover’s Wife (1980) is a fitting story to end this review. It ought to be set straight. All very well for them to spin yarns and make jokes but nobody has written any sense about me. nobody has even given me a name except one and he got it wrong and said I was called Hazel. The drover’s wife, the doctor’s wife, the butcher’s wife. You wouldn’t think of all the countries the one where women are the fewest would be the one where they don’t exist, where men’ll say ‘the missus’ sooner than give a name. In a chronology I couldn’t quite keep up with Jeffris’ DW is first a kid from the backclocks of NSW who runs off with a dentist [the Murray Bail story]; runs into Henry Lawson – “so I told him a lot. Talked too much – must’ve – because some of it he took and turned into that story about the snake …”, and the story about Mary, the Aboriginal midwife, and the story about the baby she lost – “That was the story I told Mr Lawson a long time afterwards, or at least the parts of it that were alright to tell a man.” Meets and is painted by Mr Drysdale, and then there was Murray Bail “who must have known the dentist”. What I meant was to tell not so much about me and the drover and the dentist and the rest of them but about how women have a history, too, and about how the Bushman’s Bible and the other papers only tell how half the world lives… We’re not sheep or shadows, or silly saints the way Mr Lawson would have. There’s more to us. More to me than any of them have written, if it comes to that. But she still doesn’t tell us her name. I’ve put up the first iteration of the AWW Gen 2 page (here) with links to reviews and posts by me, Lisa/ANZLL, Sue/Whispering Gums, Kim/Reading Matters and Brona’s Books – check them out and see what else I can add – and links also to stories and novels readable as pdfs or downloadable to e-readers.